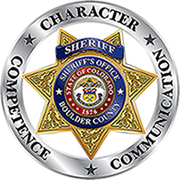 This online system will allow you to pay your Boulder County Sheriff’s Office summons/ticket. It can take 2 to 4 business days for summons/tickets to be entered into the system and be available for payment. If it has been less than 4 days, please check back again soon or contact the Boulder County Sheriff’s Office at 303-441-3650 for more information. This service is provided by a 3rd party vendor, Colorado.gov. There will be a $0.75 base charge, plus an additional 2.25% for all payments made by credit cards to help develop, enhance and maintain the service. Payments may also be made via mail or in person using cash or check to avoid additional charges (see back of ticket for instructions on making a cash or check payment). Payment must be made within 20 days of the ticket’s issue date. Summons/ticket number – found in the upper right hand corner of the ticket. Summons/ticket issued from the Boulder County Sheriff’s Office beginning with ONLY letter “B” or “P“.